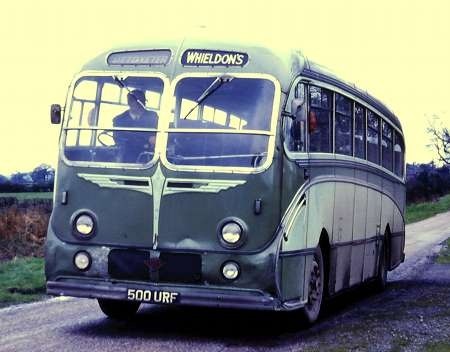 From the beginning of November 1973 Whieldons o/w The Green Bus Service was taken over by the National Bus Co with Midland Red continuing much of the network although three Uttoxeter services passed to PMT o/w the Potteries Motor Services. Mr C J Whieldon had commenced bus operation in May 1927. By chance, I had a few rides in the spring of 1972 by catching an early Saturday journey out of Rugeley for Uttoxeter via Drointon returning direct via Abbotts Bromley. I still have a faded Setright ticket which might have been a return. The latter service was always a newish Seddon Pennine IV bus which continued on to Cannock but the Drointon service was an older coach no doubt as it wandered the country lanes. On one occasion I caught a Ford 570E with Duple Yeoman body i.e. it looked and sounded like a Bedford SB with a seat next to the driver. Once I enjoyed a ride on 500 URF, a Guy LUF with Burlingham Seagull coachwork which the company had bought new in 1958. The first passenger boarded somewhere in the lanes and the opportunity was taken for a photograph. Oh dear, Keith; the mention of the excellent Guy Arab LUF in the same paragraph as the Seddon Pennine IV illustrates the decline of Green Bus from the sublime to the ridiculous. The Pennine IV was an abomination. Guy offered an underfloor engined chassis, initially the Arab UF, and then from 1953, the the lighter LUF, between 1950 and 1959, after which date the manufacturer chose to place all its eggs in the one ill fated basket called the Wulfrunian. It is rather curious that the Tilling group depended heavily upon Gardner engined underfloor engined chassis, yet the BET, municipal and independent sectors had limited choices of Gardner powered UF models. Atkinson, Daimler and Guy all produced Gardner engined underfloor chassis, but orders were never large. Daimler offered epicyclic transmission as standard, which was an option with Guy, but otherwise the gearbox in Atkinson and Guy models was of the constant mesh variety. The decidedly heavy Daimler Freeline was additionally suspect by virtue of its high pressure hydraulics until an air pressure variant became available. North Western Road Car sought to recreate Bristol simplicity and reliability in the rugged Atkinson chassis, but the heavy hand of BET central control stopped this project in its tracks, and Atkinson never really made much of an impression thereafter. Guy were generally more successful, but the real problem lay in the availability of the AEC Reliance, which, with its light steering and excellent synchromesh gearbox, was a driver’s dream. Even when the shortcomings of the AEC wet liner engines began to emerge, the sales scenario did not alter materially, though Leyland picked up customers with the introduction of the Leopard. I have often wondered if the availability of a decent synchromesh gearbox to the smaller makers might have influenced the situation in their favour. Perhaps the ideal would have been a Gardner powered Reliance. One is surely allowed to dream! I get the impression that BET’s central purchasing policy was more about bulk discounts, and cost generally, than anything else. Guys were almost certainly more expensive than Leylands and AECs, and the company might not have been able to handle the quantities required to allow bulk discounts. Perhaps it’s just the angles of the photo, or maybe 500 URF was simply way past her best by then, but this might just about be the ugliest and most downtrodden Seagull I have ever seen. Were the glorious, beautiful Seagull bodies different for each type of chassis ? I am not a Seagull expert but this I believe is the later version with the front entrance body and I believe has a higher waist line. IMHO the best derivative was the centre entrance version on the 8ft wide chassis as on Tiger Cubs and some Reliances. I also had a soft spot for the Ribble/Standerwick domed versions as they looked like a purposeful express coach. This is a very late example of a Seagull Mk V body, but incorporates many non-standard features, most notably the straight moulding at skirt panel level. Burlingham had already moved on to the Mk VI (with window pans as supplied to Ribble and others) and the Mk VII (with "panoramic windows"), so I suspect that these later Mk V bodies were made from whatever bits were left over. These "Meccano Kit" bodies (both from Burlingham and other body-builders) tended to end up on low-volume chassis at the end of their production runs. Seen at their base in Cheltenham Coach Station on Sunday 20 August 1967 on Associated Motorways services are two members of the Black and White Motorways fleet. 182 (PAD 182) is a Willowbrook bodied Guy Arab LUF, new in 1955 and 222 (8222 AD) is a Duple bodied AEC Reliance new in 1961. 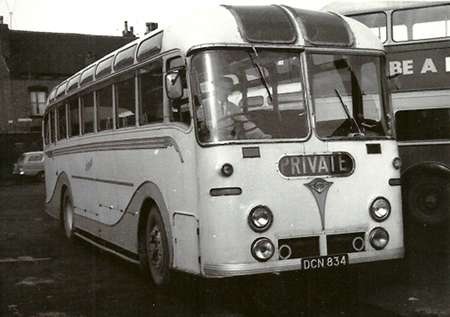 Both are 37 seaters, with a centre entrance, which was standard for Black and White at the time, apart from a batch of 5 Roe Dalesman bodied Reliances new in 1959, which had 41 seats and a front entrance. The somewhat flamboyant Duple body on 222 contrasts with the restrained, classic elegance of the ECW bodied Bristol MW in Royal Blue livery alongside, also on Associated Motorways work. Another gem! 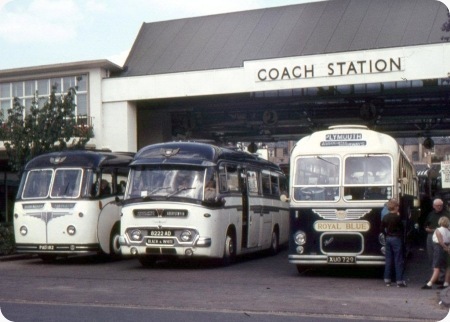 I never experienced Cheltenham Coach Station, but I had two years of coach travel between Birmingham and Lancaster in the 1966/68 era. A veritable rainbow on steroids. What a great pic. Things aint what they used to be. Thanks for sharing that. As an AEC (and Bristol) man, it’s amazing how many Guy Arab UF/LUF coaches have pitched up on this forum in recent months. I never came across one personally, but it is significant how many of you hold them in high regard and great affection. I worked in and out of Cheltenham from Eastbourne in the summer during the early 70’s when working for Southdown arriving to connect with the 16:00 hrs mass departure and leaving the next day with the 14:00 hrs departure these mass departures were a sight to behold looking chaotic but in reality very well organised any late arrivals contacting the control office to advise of any onward connections so that only those services needing to be held back were. I remember the Reliance/Duple coaches by that time relegated to mainly duplicate journeys and were not very popular and known to all Black & White drivers as "Bubblecars" usually given to first season drivers who were then told to follow the service car he then found the service driver with the well known request "don’t lose me as I’ve never done this run before". I never lost one and always felt sorry for them as I felt it was not a good way to learn any route especially one like ours which took around 7 hours. One of the station inspectors told me they could get around 140 coaches in the yard, to me it seemed they proved it on many summer Saturdays and as this was in the very early days of National white livery with many vehicles still in company colours it was a truly magnificent sight also of course there were many private company vehicles on relief journeys which added to the spectacle. Oh happy days. I agree about the Weymann Fanfare, Ronnie. I Remember it well driving my new 53 seater Ford with Plaxton body on dupe from Leicester to Cheltenham and ending up in Devon on service, Anyone out there remember the old Caff in Bridgewater open all night.